Various technical and integrity measures have been introduced targeting mainly corporates, which on the face of it appear minor, but could result in significant additional tax revenue which is, according to the Government, unquantifiable at this stage. Announced in the 2013‑14 Budget, the Protecting the corporate tax base from erosion and loopholes — closing loopholes in the consolidation regime measures contained integrity rules which prevented non‑residents from ‘churning’ assets between consolidated groups to generate double deductions. That measure applied from 14 May 2013. The Government has deferred the start date of one aspect of the measures, which requires grouping of associates when considering whether the integrity rules apply. These grouping rules now apply from the date of introduction of the enabling legislation. Basically, the ‘churning’ happens, for example, when a non-resident shareholder disposes of shares in an Australian company to a related Australian resident taxpayer that is part of a tax consolidated group. Because such shares are not Taxable Australian Property there is no capital gains tax. Furthermore, the tax consolidated group refreshes the cost base of the underlying assets of the acquired Australian company to market value, essentially generating an artificial uplift in the cost base of the assets and a potential double dip/deduction. 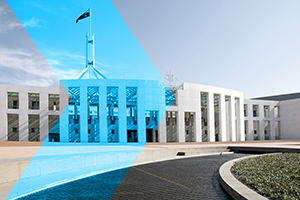 Announced in the 2016‑17 Budget, the Tax Integrity Package — deferred tax liabilities measure removed adjustments relating to deferred tax liabilities from the consolidation entry and exit tax cost‑setting rules. The measure contained complex transitional rules which required taxpayers to determine if any deferred tax liabilities were included in entry tax cost‑setting calculations — if so, the measure would not apply. Following consultation, those complex transitional rules were removed from the final legislation. As part of the Australia’s multinational tax integrity rules to combat the shifting of profits by major multinational groups to tax advantaged jurisdictions, the definition of an SGE has been extended. The current definition applies only to an entity which is a member of a group headed by a public company or a private company required to provide consolidated financial statements. Additionally, the group is required to have turnover of at least $1 billion. The definition will be broadened to include members of large multinational groups headed by private companies, trusts and partnerships. It will also include members of groups headed by investment entities. This measure will also ensure the Commissioner’s power to determine an entity to be an SGE parent operates as intended. The TOFA rules set out the amount and timing of gains and losses on financing transactions for tax purposes. Simplification of the TOFA rules was announced in the 2016-17 Budget. The start date for simplification has been deferred to the income year commencing on or after the date of Royal Assent of the enabling legislation. The simplified rules are intended to prevent unintended outcomes and to ensure compliance cost savings are realised. From 1 July 2019 all entities must rely on the asset values contained in their financial statements for thin capitalisation purposes. Valuations that were made prior to 7.30PM (AEST) on 8 May 2018 may be relied on until the beginning of an entity’s first income year commencing on or after 1 July 2019. This change will ensure that asset valuations used to justify debt deductions are robust. The Government will also ensure that foreign controlled Australian consolidated entities and multiple entry consolidated groups that control a foreign entity are treated as both outward and inward investment vehicles for thin capitalisation purposes. This will apply for income years commencing on or after 1 July 2019. This change will ensure that inbound investors cannot access tests that were only intended for outward investors.